Yes, that's right, Heritage Natural Finishes aren't just for wood any more! It turns out that our finishes produce a beautiful and rugged surface on earth work! We make a special earthen floor oil and wax for Claylin, Inc. that is called Claylin Oil and Claylin Wax which you can order through Sukita Crimmel at Claylin, Inc. HERE. First, build up coats with our Claylin Oil Finish, then top coat with Claylin Wax. For more information about oiling Earthen Floors, please contact Sukita at 503.957.6132 or on her website HERE. 6 coats of Concentrated Finish Oil (Earth Finish) is a product of 0.029 x total square feet of earthen floor. 1 coat of Liquid Wax End Sealer is a product of .002 x total square feet of earthen floor. 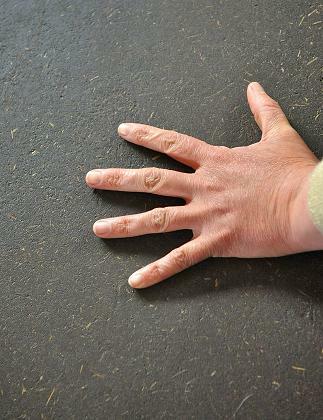 To finish your earth floor, apply our Concentrated Oil (Earth Floor Finish) 4-6 coats over several days. You don't need to thin this product. Buff in a thin top coat of our Liquid Wax End Sealer for a more finished top coat. Dries to a matte sheen. Packaged in a one quart, clear glass round jar with wide-mouth metal screw-top lid. This is the same product as our Concentrated Finishing Oil just a different label with earth finishing specific labeling. The finish comes in a one-gallon epoxy lined metal paint-style can. This is the same product as our Concentrated Finishing Oil just a different label with earth finishing specific labeling. Packaged in a 3 gallon steel pail with a pour spout top. $81/gallon. This is the same product as our Concentrated Finishing Oil just a different label with earth finishing specific labeling. Packaged in a heavy duty 5 gallon, epoxy phenolic lined steel pail with a pour spout top in the lid. This is the same product as our Concentrated Finishing Oil just a different label with earth finishing specific labeling. Product is packaged in a 55 gallon steel phenolic lined drum with two standard bung openings (works out to $60/gallon). We ships drum orders with a Freight carrier and will have to get back to you with an accurate rate quote. The rate quote shown on this site will give you a very high rate with FedEx Ground. Just click it anyway and we will adjust the price down once we get the correct shipping rate for you and contact you with the real cost. We need a lead time of 2-3 weeks to fulfill drums orders. This is the same product as our Concentrated Finishing Oil just a different label with earth finishing specific labeling. Photo credit: Photo submitted by Sukita Crimmel, From These Hands, LLC. Portland, OR. Used with permission.